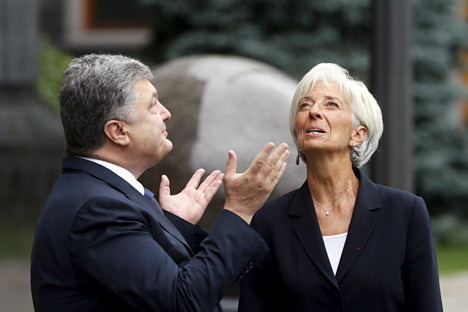 Ukrainian President Petro Poroshenko welcomes IMF Managing Director Christine Lagarde ahead of their meeting in Kiev, Sept. 6, 2015. The International Monetary Fund has allowed lending to countries that are in arrears on their debts to sovereign creditors. This decision will allow the fund to continue the program of assistance to Ukraine, even if the country does not return the $3 billion it owes to Russia. Russian experts claim the new policy undermines the foundations of the global financial system. The International Monetary Fund (IMF) has decided to review its policy toward countries that are in arrears to sovereign creditors, Bloomberg reports, citing IMF spokesman Gerry Rice. Previously, the organization's charter prohibited the provision of financial assistance to countries that are in arrears on already existing loans. The IMF's Dec. 8 decision was opposed by Russian representatives in the organization, but they could not influence the vote, since they have a total of 2.39 percent of the vote in the council, the Russian business newspaper RBK Daily reports. "The decision of the IMF provided the opportunity for other debtors as well to freely interpret obligations on sovereign debt. By doing this, it has laid a mine under the entire system of international finance," said Andrei Margolin, vice-rector of the Russian Presidential Academy of National Economy and Public Administration. According to Margolin, "the risks of lenders have increased significantly, and this suggests that the reform of the IMF is not far off." At the end of 2015, on Dec. 20, the Ukrainian authorities will have to repay the debt of $3 billion to Russia, but as Kiev has repeatedly stated, it has no intention of doing this. In the case of non-repayment of funds, according to the old rules of the IMF, the organization would have had to stop its assistance to the country holding the debt. In November 2015, Russian President Vladimir Putin proposed restructuring Ukraine’s $3 billion debt; the country would receive a year’s respite and then have to return the funds of $1 billion a year over the next three years. However, in order to do this, Russia needed financial guarantees from the other countries, including the U.S. and the E.U., or financial institutions, including the IMF. As Finance Minister Anton Siluanov said at his Dec. 9 meeting with Putin, Russia was unable to obtain such guarantees. "We received an official denial from the U.S. government to provide a guarantee for the obligations of Ukraine," said Siluanov. According to the Finance Ministry’s official report, the Russian authorities are planning to apply to the London Court of International Arbitration if they do not receive payment in full from Ukraine. "Apparently, the E.U. and the IMF are trying to distance themselves from this conflict, so that it is resolved solely between Moscow and Kiev,” said Sergei Ilyin, an analyst of the investment company Premier. According to Ilyin, by and large, everyone understands that the provision of these guarantees will mean that Europe will have to pay for Ukraine. "Non-payment of this debt will fall heavily on Ukraine in any case, so it will be better for all if they pay or are able to agree on restructuring," he said. In turn, the Ukrainian authorities explain their position by saying that they cannot provide Russia with better terms than other creditors, who previously agreed to write off part of the debt. The last time the IMF amended its lending rules was in 1998, when the fund allowed lending to countries that do not pay debts to commercial banks – holders of their sovereign bonds. However, a debt owed to international institutions and other states did not allow the debtor to receive funds from the IMF. At the end of October 2015, The Wall Street Journal – citing Douglas Rediker, a former U.S. representative to the IMF Executive Board – reported on the IMF's intention to change the rules "to avoid an outcome where Russia could hold the fund program hostage." However, according to Ilyin, "the IMF is traditionally stalling in the hope that the problem will be solved by itself." "Ultimately, the problem is to prevent a humanitarian catastrophe in Ukraine, as everybody will lose as a result. However, the precedent by itself, of course, can have a negative impact on the reputation of the entire institution in the business community," he said.